If you happen to be a proud owner of a couple of oil wells, then chances are you can afford having several sparkling Swiss-made watches and switch between them depending on the occasion – one for golfing, one for those fancy receptions, one for an afternoon of sailing the yacht across the bay, and so on. 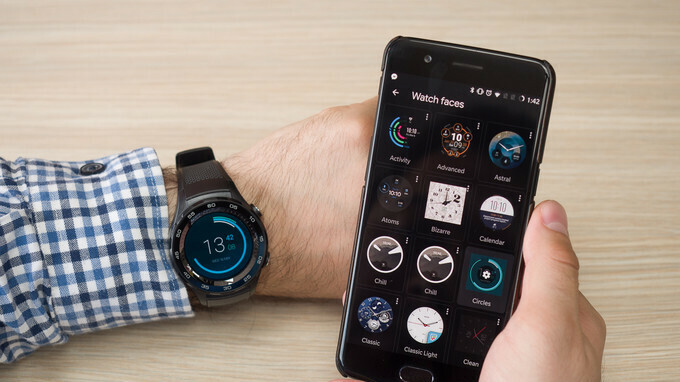 That kind of luxury is beyond the grasp of mere mortals, but a Wear OS smartwatch can be the ideal alternative. One of the many things to love about smartwatches is how switching to a different watch face can feel like having a completely different timepiece. But with thousands of watch faces available on Wear OS (formerly Android Wear), choosing the best ones for you can be rather difficult. That's why we decided to share our favorites with you, divided into three categories: analog watch faces, digital watch faces, and oddities that deserve a category of their own. Analog watch faces have a distinct, classic appearance and never go out of fashion. At the same time, they don't appear as geeky or as sporty as their digital counterparts. And sure enough, they are the perfect choice for a round smartwatch. Here are some of the best classic Wear OS watch faces you can get right now. The name of this clean, clutter-free watch face says it all. Simple I is minimalist in appearance, while the bold hands and contrasting colors make it easy to read with a quick glance. It is also a great power saver and has built-in display burn-in in protection. But if you want something with a bit more color to it, better move on to the next item on our list. Pear is a suite of watch faces that emulate the look and feel of the ones you'll find on the Apple Watch. You are free to personalize them to your heart's desire – by adding or removing complications, for example, or by changing the colors of the ticks and hands. Pear is suitable for both round and square watches and includes both analog and digital watch faces. VAER is another watch face with a clean, classic design. It is compatible with both round and square watches, but offers no color schemes or alternative layouts other than what you see in the screenshot, with either white or black background. Still looks great, though! Despite its name, there's nothing odd about this watch face. We find it quite stylish, and we like how the current hour is enlarged to be more clearly visible. There are several color schemes to pick from, and the tame, conservative color options make them suitable for a broad range of smartwatches with classic design. Mustache may be simple in appearance, but it is also highly customizable: you can add complications that display your steps or battery level, you can pick different color combinations, and you can select from 12 premium themes. On top of that, the watch face switches automatically to night mode at sunset. Wile Mustache comes with a couple of free themes, the 12 additional ones can be purchased from the Mustache Android app on your phone. Pujie is a suite of watch faces that has a lot of attractive, interactive, and highly customizable analog options in its catalog. While it costs a couple of bucks, it may be the last watch face that you ever download. Don't forget to download the accompanying app to gain access to new watch face presets. Here's a clean, analog watch face with a twist – the glare effect produced by the background rotates in a realistic fashion as you move the watch. The watch face itself is functional, stylish, and easy to read with its high-contrast color schemes. Digital watch faces are modern, practical, and efficient. They can be as simple or as sophisticated as one desires. And somehow they feel like a natural match for an electronic watch. Our favorite Wear OS digital watch faces are in the gallery below. If you're into buttons and complications, check this one out. Advanced Watch Face is customizable and sophisticated, allowing for lots of data bits to be displayed: battery level, steps taken, weather information, and so on. Electron is a bit cleaner and more elegant with its design and layout, but it does leave enough room for showing additional bits of information, including the current date and day of the week. The watch face supports both round and square displays. This is one of the most feature-rich watch faces you can get. In addition to multiple complications displaying steps, weather, and battery level information, EveryDay Watch Face has built-in music controls and a launcher for accessing apps installed on your watch. The watch face supports both round and square displays. If you dig clean, minimalist designs, chances are you'll like Timr Face. It is a simple watch face that shows the time in big, easy to read digits, while a customizable accent at the bottom adds character. Radii is another watch face that puts simplicity first, although it does show quite a bit of information if you take a closer look. Battery level is shown on the right, while the date and day of the week are displayed on the left. The extensive use of black in this watch face makes it a great battery saver, but you are free to customize its appearance if you wish to buy the full version. From the makers of the award-winning puzzle game Monument Valley comes a suite of watch faces designed with sense and style. It has some great analog watch faces too, but it is the digital ones that we dig the most. They have a clean, simple layout, but offer plenty of functionality through additional complications and shortcuts. And here's a list of watch faces that deserve a category of their own. They are not necessarily the most practical, the most functional, or the most power efficient watch faces Wear OS has to offer, but they have a certain appeal that makes them stand out. The name of this watch face says it all. Mysterious Forest is a colorful, mesmerizing watch face beautified by twinkling fireflies. And when you tap on it, a cute critter appears! It even has a matching ambient mode showing the outlines of the forest. Fiore is a colorful watch face with beautifully drawn floral arrangements. Seven different layouts are available, one for each day of the week. You can quickly toggle between them if you want the color of the flowers to match your outfit. As hinted by its name, this Google-made watch face uses examples of great street art as backgrounds. These are rotated occasionally, keeping your timepiece fresh and trendy. You may pick between analog, digital, or minimal layout from the face's settings menu. Inspired by Google's developer conference and its theme, this colorful watch face adopts the quirky style and smooth animations of the I/O countdown timer. It may be a tad tricky to tell the time, frankly, but its geekiness factor is off the charts. Nothing says "nerd" like a binary watch. While bystanders will be baffled by the mysterious dot pattern it displays, the enlightened will be instantly able to tell the time with a glance at the encoded digits. And if that's not geeky enough, here's DosFace – a watch face inspired by the grand-daddy of operating systems. The time and date are shown in the unmistakeable Terminal typeface, while a tap on the face displays the battery level. I use Pujie Black on all my watches and it's close to perfect. The only thing that would make it better, is a designer/edit app on the PC instead of the smartphone.